Flapjacks and Hobnobs ~ I Can Do That! McVitie's cookies and digestives are my long time favorites British stuff. I usually get them from World Market whenever they are available. 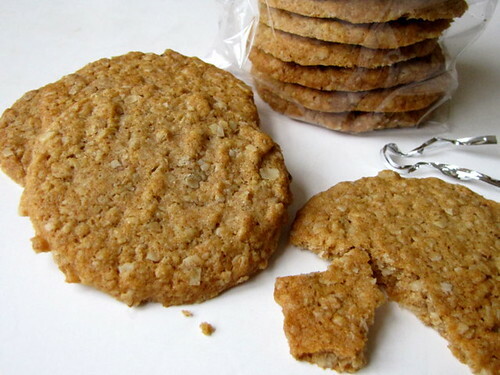 A few weeks ago I bought a package with 3 different types of biscuits and one of them is the highly addictive crunchy Hobnobs which according to the package are made with rolled oats, whole wheat flour, margarine, brown sugar, golden syrup, and baking soda. I looked for a recipe online and most have exactly the same ingredients as the package, with a few different variations in the preparation. Having made the digestives and Jaffa cakes once before I thought why not bake some. The Hobnobs ingredients, except for whole wheat flour, remind me of the British oatmeal bars called Flapjacks which I read about in the bon appétit magazine several months ago. I had to search for it which means reading the table of contents of a few issues and found it in March. 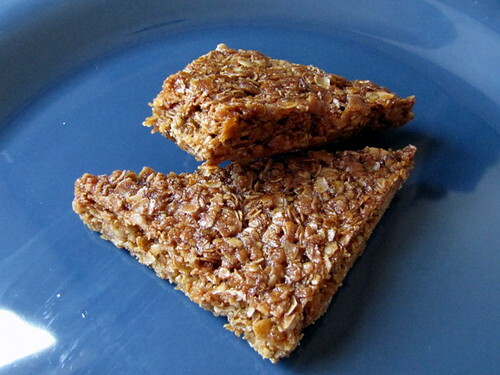 The recipe which the author says is similar to Rice Krispies Treats is unbelievably simple to make yet delivers a satisfyingly delicious caramelly oatmeal bars that are chewy in the middle and crispy at the edges. They are addicting just like the Hobnobs. It's a good thing Lyle golden syrup from the UK is widely available [in almost all grocery stores] where I live. This essential ingredient for both flapjacks and hobnobs is a very very thick syrup and although the ingredient indicated on the label says it's cane sugar syrup, I can taste a hint of salt which I really like btw, and I end up licking my fingers and the spoon I used. But I might be mistaken about the salt. Anyway, look for them at your grocery store's baking section near the sugars and syrups. Preheat oven to 350°F. Butter an 8 x 8 x 2 inch metal baking pan. Combine first 3 ingredients in heavy medium saucepan. Stir constantly over medium-low heat until butter melts, sugar dissolves. Remove from heat. Add oats and salt, stir until coated. Transfer mixture to prepared pan and spread out in even layer. Bake until top is golden (edges will be darker), about 25 minutes. Cool in pan on rack 5 minutes. 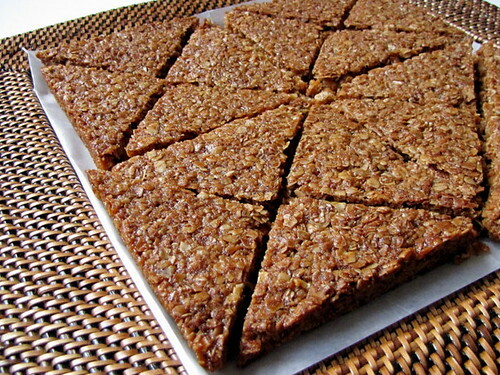 Cut into 4 squares, cut each into 4 triangles (mixture will be soft). Cool completely in pan before serving. Pulse the oats in a food processor a few times to break them up into a coarse consistency but do not process too much. In a large bowl, whisk the oats, flours, baking powder, and salt until thoroughly combined. In a medium saucepan, place butter and syrup and heat gently while stirring until butter melts and sugar dissolves. Turn off heat and stir in baking soda; then add to the dry ingredient mixture and stir thoroughly to combine. Using a small scoop, measure out round pieces and place on a parchment-lined baking sheet 3 inches apart. Shape the pieces into balls and with a fork or a small glass, flatten into ¼-inch thick rounds, they will spread while baking. Bake for 15 minutes. Let cool in pans on a rack for 5 minutes. Remove from pans and cool completely on wire rack. Optional: Melt some milk chocolate and spread on top. Let the chocolate set completely before serving. I myself prefer these cookies plain. These look great. I love it when you are able to make something that you love to purchase.